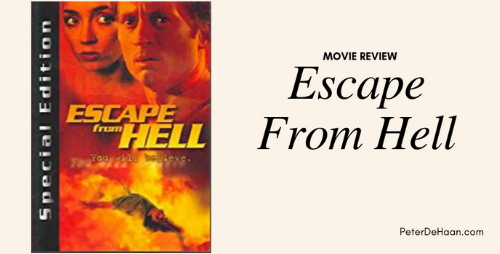 Escape from Hell is an evangelistic drama in which a skeptical doctor is determined to disprove the existence of the afterlife. Driven to desperation through a series of events, the intellectual healer plans to conduct a test: self-inducing a near-death experience, complete with a plan that trusted colleagues will arrive in time to resuscitate him, rescuing him from the brink of death. What he ultimately discovers is not just a glimpse of heaven, but also the despair of hell, where he is ultimately sent. The premise of this movie — a near-death trip to hell — is both intriguing and compelling. The story line is cleverly interwoven, moving easily between the present and the past, with the scene of hell providing a gripping understanding of what the netherworld might be like.